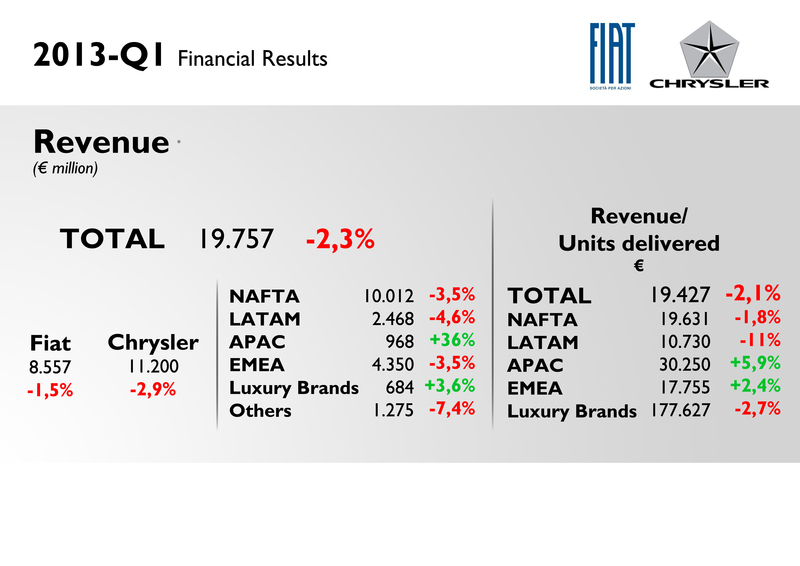 Good results could be the final conclusion of 2013-Q1 Fiat Group report. There are bad numbers (such as Europe’s situation), but generally speaking the group did well in the first quarter of this year considering some specific facts. It means that neither volume nor profits grew up but most of the reasons for this are related to projects or activities focused on generating more sales and cash in the coming months. I’ll try to make a short/easy but complete analysis of the report released by Fiat Spa in April 29th, adding some information about sales registrations in the most important markets. The group sold fewer cars and therefore total revenue fell (because of a worse mix product/price). This doesn’t mean that the situation is getting bad for Fiat-Chrysler. In fact, is something that the company had already predicted based on many facts that together generated this tiny slump (-2%). Mainstream brands (Chrysler Group + Fiat Group Automobiles) delivered 1,017 million units in the whole world in the first 3 months of this year (VW Group sold 2,27 million). That number is 2% smaller than 2012-Q1. The revenues of whole group (Chrysler Group + FGA + Ferrari & Maserati + Components division), fell 2,3% to 19.757 million euros. In other words, including Ferrari and Maserati’s deliveries, the group was able to sold (revenue) 19.368 euros/car (last year the revenue was 19.784 euros/car). The reason for this fall is explained by fewer deliveries in NAFTA, EMEA, and LATAM. In the case of NAFTA, fewer deliveries don’t mean fewer sales, as the group decreased the production of some of its models to allow the introduction of new ones (the new Grand Cherokee). In EMEA region the fall on revenues (-3,5%) is explained by the reduction on deliveries (and final sales), and the war on prices in all European markets (continuous rebates deteriorates total revenues). Fewer deliveries of key products to be updated in NAFTA and more industrial costs coming from the launch of the new Jeep Cherokee. NAFTA’s EBIT is down 36%. In other words, Chrysler spent more because of the start of production of the new Cherokee, and delivered fewer units of the Grand Cherokee because of the change on MY (to reduce inventories of the old generation). LATAM profits did also fall from 235 million euros in 2012-Q1 to 127 million in 2013-Q1. It happened because of higher industrial costs that exceeded higher volume sales. These costs are the result of the regular closure of the plant that didn’t take place in December (as always) but in February 2013 (I guess is summer vacations closure). Besides, FIASA (Fiat South America) is having some problems with imports from Mexico, and spent more in advertising campaigns. 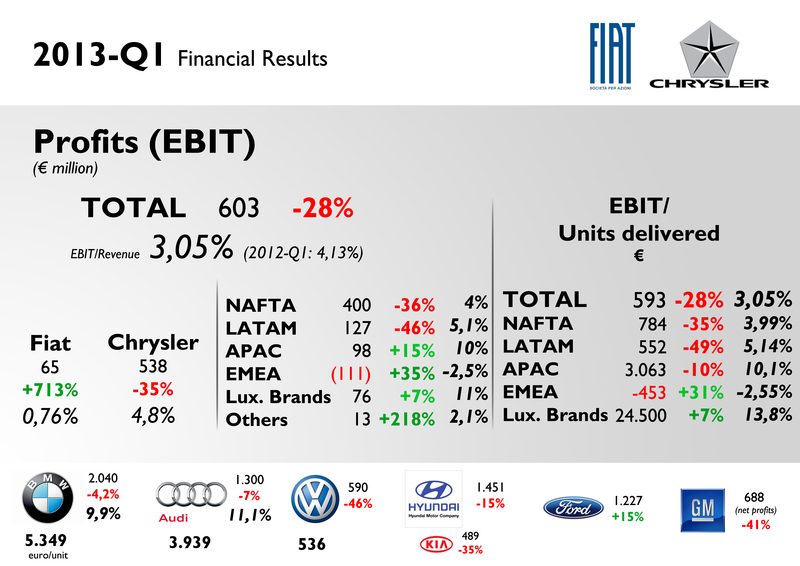 In EMEA EBIT continues to be negative but had an improvement compared to 2012-Q1. The region burnt 111 million euros as a consequence of collapse on demand (mainly Alfa Romeo and Lancia brands). 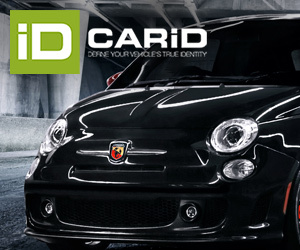 But the cost reduction plan and the good performance of the Fiat 500L sales allowed the group to reduce loses from 170 million euros negative EBIT to -111 million euros in 2013-Q1. As it continues to be a small region for Fiat-Chrysler, APAC’s rise on EBIT wasn’t enough to offset the fall in other regions. The good result is due to better sales performance than the rise on commercial costs related to the expansion in this market. Car demand is so growing so fast that it offset the rising costs. Luxury and sporty brands were again one the most profitable division of the group. Ferrari’s EBIT jumped from 56 million euros in 2012-Q1 to 80 million in 2013-Q1. This is because of higher demand and higher revenue coming from licensing and personalization programs. Maserati didn’t do that well burning 4 million euros (one year ago it earned 16 million). More expenses related to the introduction of the new Quattroporte explain this fall. Lower EBIT took to lower net profits to 31 million euros, against 262 million one year before (-88%: the fall is also explained by amendment on IAS19 accounting rule in which it is expected higher pension expense as part of ‘Employee Benefits’). Earnings Before Interest and Taxes fell 28% to 603 million euros. It is 3,05% of total revenue, worse than 2012-Q1. The reason for this deterioration is NAFTA and LATAM regions. NAFTA spent more on production and commercial issues related to new models, and LATAM closed Brazilian factory in February 2013 and spent more on Advertising campaigns. The group burnt money in Europe again, but this time less than previous period. This was possible thanks to cost reduction. Fiat-Chrysler earned 593 euros for each car it delivered, down 28%. The company earns 24.500 euros for every Ferrari/Maserati it sells, and loses 453 euros for each Fiat/Lancia/Alfa/Jeep it sells in Europe. In the bottom of this chart there is information about 2013-Q1 results for some brands and groups. BMW earned 2,04 billion euros which is 10% of its revenues (one of the highest EBIT/Revenue indicator in the industry). VW figures correspond to VW brand. Hyundai figures correspond to Hyundai Motor Group (Kia included). The company’s total debt had a tiny increase as a consequence on investments made by Fiat Group (Maserati’s plant). Chrysler reduced its debt. This change is based on 2012-Q4 figures. Liquidity, that includes credit lines, improved in the same period from 20,8 million euros in December 31st of 2012 to 21,3 million in March 31st 2013. Good results coming from USA where sales increased 7,6% to 429.000 units. In Brazil, Fiat registrations are quite stable at 179.000 units, up 3%, a bit better than total market. In Italy things aren’t going as bad as before: FGA + Ferrari and Maserati reported sales of 103.000, down 9% (against -13% of total market). Fiat brand’s sales fell only 1,2%. In Canada, the group leads the ranking with 58.000 units, up 4% (Fiat brand falls 23%), and got a record market share of 16,3%. Argentinian results are also good with 29.000 units delivered, and Fiat brand was the only major car maker to increase its sales. It is not the case of Mexico, where sales barely grew up (+0,6%), as Chrysler Group’s fall was somehow offset by Fiat brand’s increase (+40%). It seems that the Fiat as a brand has already hit bottom rock: its sales are up 2% in France where the market fell 15%. The same happened in Spain: Fiat brand is up 2,3% in a market down 11%. In both markets, Alfa Romeo and Lancia registrations are extremely low and bad. In Germany, the whole group falls 14% against 13% for the whole market. In the UK, which is the only market in Europe not to face difficult times, total sales are up 7,4% and Fiat Group’s sales are up 4% as Fiat brand’s good performance (+14%) was overshadowed by the drop on Alfa Romeo, Chrysler and Jeep sales. I like to think Fiat’s position is at least comfortable, but my mind keep saying… Fiat is not going so well. I hope with Chrysler’s fusion, Fiat start to gain money again! Fiat has to do something about Alfa Romeo and Lancia quickly. New models with better choice of engines and recognizable desing. Also, they need to act smarter then until now. Revival of iconic cars is something that Fiat should do. They had a good chance with Lancia Delta, great iconic sporty car. But, what did they do, they made something completely different. Alfa Romeo will be a key to Fiat S.P.A success. It has great tradition and big potential. On USA market it cold make boom. China would also be good market for some new E and F segment of Alfa-Lancia. FIat should also protect and improve its greatest market, South America, where cars are selling better than ever. Cheap Autobianchi is a good idea, but Fiat needs bigger network of dealerships in eastern Europe and Asia for its success. Good children of this group are, and will allways be, Maserati, Ferrari and Iveco. Adi, Fiat announced they’ll spend more than 15 Billions of Reais (Brazilian Money) until 2016 in Brazil. They’ll build a new factory, improve Betim’s factory and improve Iveco, CNH factories. Fiat will not lose the #1 in Brazil until 2014. After that, i can’t tell you what will happen here in Brazil. What do you mean? what will happen after 2014? Two years is too much time to believe in what will happen. After 2014, all cars sold in Brazil must have ABS+AIRBAG2 and 50% of sales of Fiat Uno is MILLE, which is impossible to receive ABS and Airbag. We’re talking about 7000-10000 cars a month, which is a high number. VW is planning to bring UP! here, while i don’t hear much notice from Fiat’s plans. * One thing that may scare is the new Fiat’s Factory will only be producing in the middle to the end of 2015. I still think Fiat will continue leader in 2014/2015, but, it will not be easy like this year. Fiat is working on Panda. I dont know if you follow market reports on bscb, but this morning great results from Germany, UK and Mexico april results. @Juan, i am looking forward to your elaboration of Fiat Professional and Iveco in the future. Hi Adi. Yes, good news coming from there. Actually Fiat Group Automobiles (Fiat, Fiat Pro, Lancia, Alfa Romeo, Abarth, and Jeep) did quite well in the whole continent and is falling because of Italian market mostly. Is FIAT a good Godfather for Alfa Romeo? That is the question. Since Fiat’s takeover 27 years ago, Alfa has yet to introduce a new mass-produced RWD car. Instead, there are two A-segment hatchbacks, and the company has given up its racing heritage and its museum. FIAT closed the Alfa Museo Storico in Feb 2011 until further notice. This fact is attended by rumors of FIAT desiring to sell off the collection and the Italian Government declaring the collection a National Treasure. Fiat acquired Alfa Romeo in 1986, and in 1995, with U.S. sales sagging, it pulled the brand from the U.S. This year the brand’s registrations are expected to fall again to shocking levels. Alfa Romeo may sell around 70.000 units. The next generation of Alfa Romeo vehicles will feature engines co-developed with iconic performance brand Ferrari, as parent company Fiat looks to return the humbled Italian marque to its former glory. Fiat CEO Sergio Marchionne admitted that making “engines worth wearing the Alfa badge” remained the biggest challenge in rejuvenating the brand. Alfa’s goal is selling 300.000 units in 2016. Is FIAT a good Godfather for Alfa Romeo? Is it possible that this is one of those times when there’s just a question, not an answer.